architect; b. 1823 (at Courtrai, Belgium) ; d. January 23, 1894. A Belgian architect of importance. Among his most notable works are the Banque Nationale in Brussels, the Banque Nationale in Antwerp, the Caisse d'Épargne at Brussels, the hospital at Tournay. decorative painter; b. July 15, 1822; d. December 1, 1892. Galland was born in Geneva, Switzerland, of French parents. He first entered the atelier of the architect Henri Labrouste, and afterward studied with the decorator Pierre Ciceri. In 1851 he went to Constantinople to decorate a private palace. Returning to Paris, he entered upon a long period of great activity. Among his most important works in Paris are the "Preaching of S. Denis," a large picture at the Panthéon, the ceiling of the great amphitheatre of the Sorbonne, twenty-six subjects representing the "Glorification of Labor" at the Hôtel de Ville, Paris, and other works. architect and ornamental designer; b. February 15, 1809; d. April 19, 1874. Son of Owen Jones (1741-1814), a Welsh antiquary. He studied at the Royal Academy, London. In 1830 he visited France and Italy; and in 1833, Greece, Egypt, and Constantinople. In 1834 and again in 1837 he went to Granada, Spain, and made numerous drawings of the Alhambra. In 1851 he was appointed superintendent of the works at the Great Exhibition in London, and 1852 designed the Egyptian, Greek, Roman, and Alhambra courts at the Crystal Palace. Jones published Plans, Elevations, Sections, and Details of the Alhambra (2 vols, folio, 1842-1845); The Illuminated Books of the Middle Ages (folio, 1844); The Polychromatic Ornament of Italy, 1846; The Grammar of Ornament (folio, 100 plates, London, 1858, 2d ed., 1865, 112 plates). architect; b. June 28, 1820; d. May 21, 1877. The youngest son of Matthew Wyatt, an English barrister. In 1844-1846 he traveled on the Continent. He was secretary of the executive committee of the great exhibition of 1851, and assisted in making the plans for it. In 1855 he was appointed surveyor of the East India Company. He was honorary secretary of the Royal Institute of British Architects from 1855 to 1859. Wyatt published An Architect's Note-book in Spain (London, 1872, 1 vol. 4to); Specimens of Ornamental Art Workmanship in Gold and Bronze from the Twelfth to the Ninteenth Centuries (London, 1852, large folio); Specimens of the Geometrical Mosaic of the Middle Ages (London, 1848, folio), etc. 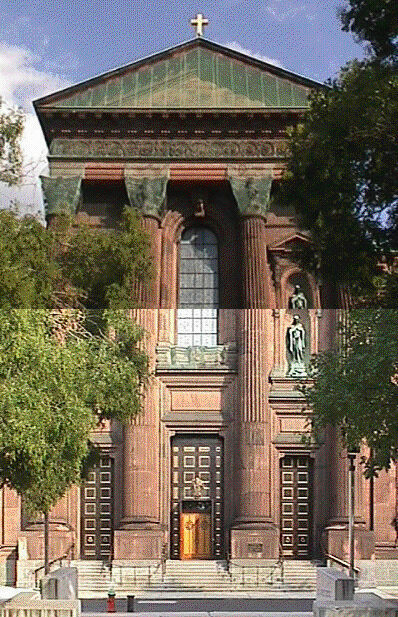 Napoleon LeBrun, Cathedral of Saints Peter and Paul (Philadelphia, PA: 1846-51), images: 2003.09.10.